I am not a fantasy literature enthusiast. (Don’t even get me started on science fiction and fantasy being lumped together). Oh, there was a time when I would occasionally read a questing book, but seldom was my interest piqued. Then came a day when I could no longer tolerate the Hermit of Xymanocles and his winged steed Zqlkmoyx climbing the Teeth of Mekjalinm in search of Belxogggm’s Sherbet. It didn’t matter if the story was compelling or well-written, I just couldn’t take one more unpronounceable name. But recently while walking the hallowed aisles of EPL, a book cover caught my attention, Helen and Troy’s Epic Road Quest. It had “quest” in the title, definitely a bad sign, but between the enticing blurb, the bitchin’ artwork and my enjoyment of the author’s Emperor Mollusk versus The Sinister Brain, I decided to give it a go. One of my favorite devices in literature, as well as in other artistic endeavors, is for an author/artist to take an established form and to mess with it. For example, Picasso, although employing an abstract style, painted classical subjects such as still lifes and portraits. Many of Terry Pratchett’s Discworld novels take well-known fables and twist them. And literary remixes like Sense and Sensibility and Sea Monsters surround actual classic books with additional text, thus making something new from something old. So I had high hopes that this quest would be the fractured fairy tale of all quests. In the world that A. Lee Martinez created for this epic road quest, Helen is a Minotaur. This is unusual. Although there are people with Minotaur characteristics here and there, very few of them are full-blown 100% Minotaur. And, life can be difficult for a 7 foot teenage girl with horns and fur. Troy by contrast is human, Asian (which helps him relate to Helen in how people can be stereotyped) and perfect in every way: handsome, fit, smart, funny, patient, unflappable. The two work together at a burger joint until the day when their leprechaun boss tries to sacrifice Helen (assuming that she is a virgin) to his god. In Helen and Troy’s world, most people are … well, just that, people. But mythical beings such as orcs and the occasional Cyclops are also a common part of the mix of creatures inhabiting the earth. And these beings do not live apart from the humans; orcs, nearly indestructible and somewhat nasty, are accountants, salespeople, and so on. This mixture of races isn’t regarded as remarkable, it’s just how things are. And as many types of creatures as there be, even more gods are toying with people’s lives. Helen and Troy are given the choice by a sort of paranormal FBI to go on a quest or die. They choose to quest, even though chances are they’ll die in the process. So the two are assigned to find certain unidentified items but aren’t told what items to look for, nor for that matter where to look. This might seem to be an insurmountable undertaking, but adventures/fables/quests follow a certain format and the two teens end up on the right track despite their lack of preparation. To tell too much more would give away the fun bits of the story, but what I can say is that this quest was palatable and enjoyable because it turned expectations upside down and didn’t use funny names. Here is a world where mythical monsters are just everyday joes doing their jobs (practically clocking in for the day) and everyone is a pawn of the gods, working unwillingly to help the immortals overcome the boredom of eternity. The tale is filled with large doses of humor, teen angst, and romantic tension between the two main characters. An orc motorcycle gang, following the command of their own god, creates further interest and comic relief. Finally, here’s a quest I can get behind. 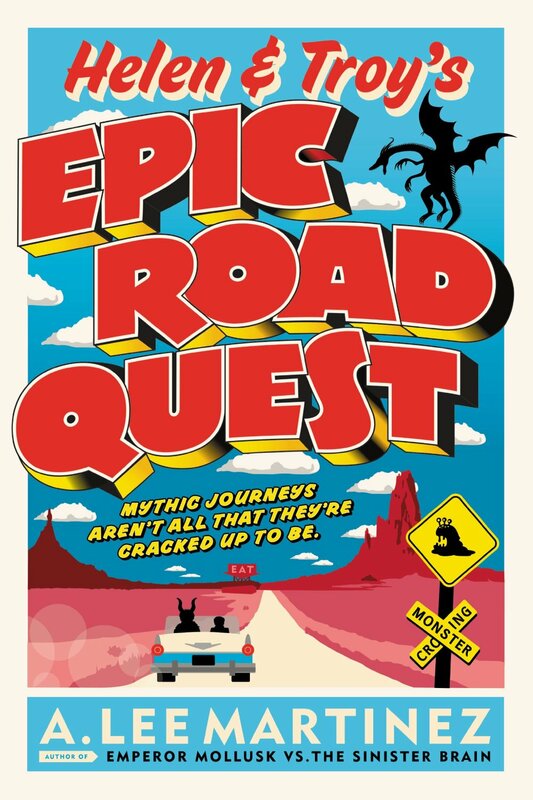 Helen and Troy’s Epic Road Quest is a Quick Pick, so you won’t find it in the EPL catalog. But try browsing the Quick Pick collection until you find this fantasy gem. If late summer finds you looking for adventure, romance and tips on how to keep boys from noticing your shedding fur, you could certainly do worse. This entry was posted in Fiction, Humor, Science Fiction & Fantasy and tagged A. Lee Martinez, mythology, quests by Ron. Bookmark the permalink. I have the same problems with Fantasy character names. I am going to recommend this book to my D&D group.